Alan Murchison’s glorious citrus hollandaise is very easy to make with your Thermomix. 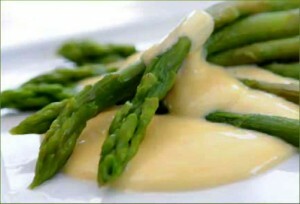 The reduction will keep in the fridge and is enough for about 5 recipes of hollandaise. Alan says you can vary the flavour by substituting any other citrus juice for all or part of the lemon juice. on the hob until half the original quantity remains. Strain, cool and keep in the fridge in a sterilised jar covered with a sterilised lid. 1. Insert Butterfly Whisk. Whisk eggs, reduction and lemon juice 17 minutes/80°C/Speed 4. 2. Set to Speed 3 and slowly pour in the melted butter through the hole in the TM lid, whisking until it is fully incorporated. Season to taste then serve immediately or store in a covered bowl in the fridge.